Welcome to the website of the Parkinson’s Disease Nurse Specialist Association (PDNSA). Based in the UK, the association was established in 1999 to act as an international resource and network for specialist nurses and allied healthcare professionals working in the field of Parkinson’s disease management. The PDNSA allows professionals to share knowledge, expertise and best practice and provides a support network for members. The PDNSA is completely autonomous but collaborates closely with other organisations to promote the role of the Parkinson’s Nurse Specialist, and to provide developmental opportunities, education and support. 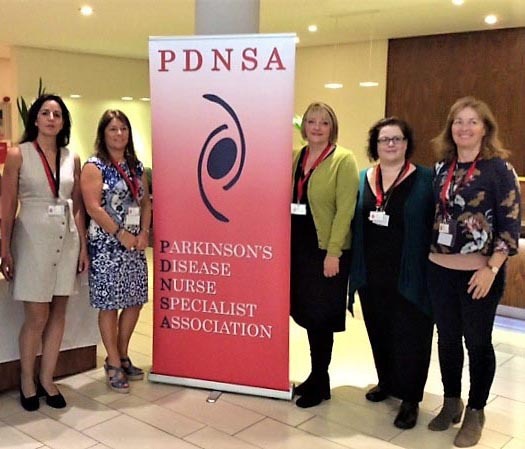 Full PDNSA membership is open to all Parkinson’s Nurse Specialists, Neurology Nurse Specialists working primarily in the field of Parkinson’s disease in the UK and EEC Countries. Cost £25 per annum. Associate membership is open to all other nurses, health and social care professionals who have an interest in Parkinson’s disease. Cost £15 per annum. Overseas membership is available for any nurse, health and social care professional living outside the UK and EEC. Cost £15 per annum. As part of our expanding services for members we are offering the chance for everyone to join online. You will benefit from the annual PDNSA conference, discussion forum and other great benefits all for a small annual sum of £25. Parkinson’s UK is the Parkinson’s support and research charity. Among our greatest strengths are our people, the enthusiasm of our local groups and supporters, and the commitment of our staff. We continue to work towards finding a cure, and improving life for everyone affected by Parkinson's. You could be part of helping us achieve this. An exciting opportunity has become available within our Advisory Services team for a Helpline Nurse Co-ordinator. Salary: £26,565 - £41,787 per annum. An exciting opportunity has arisen for a Registered Nurse to join the dynamic multidisciplinary Parkinson’s team at University Hospitals Coventry and Warwickshire (UHCW) NHS Trust in the role of Trust Parkinson’s Disease Nurse Specialist (PDNS). The post is based at UHCW which is one of only 27 Specialist Neuroscience Centres nationally. The team has been pivotal in setting up and co-coordinating the West Midlands Regional Parkinson’s Network. The job is being advertised as a Parkinson’s Disease Nurse Sister (band 6), with opportunity to develop into the role of Parkinson’s Disease Nurse Specialist (band 7). If however you meet the criteria of the Parkinson’s Disease Nurse Specialist (Band 7), you can apply for this directly (see band 7 job criteria). Best practice examples of nurses and pharmacists working together. The RCN are planning a joint conference event with the Royal Pharmaceutical Society at the end of the year, and we are looking for best practice examples of nurses and pharmacists working together to improve patient care in settings outside hospital. We will be looking for people to speak at the conference but also for posters for the exhibition. Please could any examples be forwarded to me c/o Nikki Mills by 30th June 2015.